Fun fact: my husband and son are Luke and Yoda in the “R” in Star. 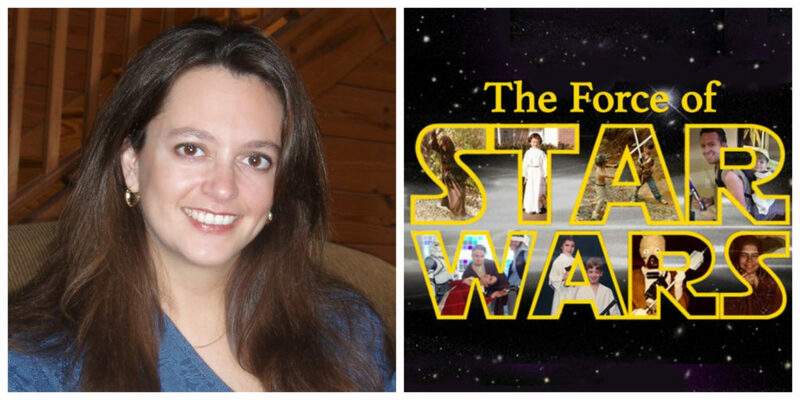 Dr. Amy H. Sturgis holds a Ph.D. in Intellectual History and teaches a class called The Force of Star Wars. 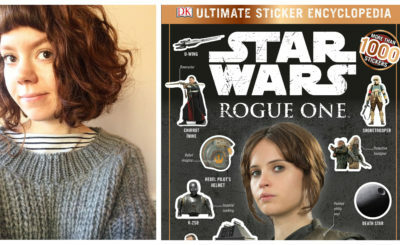 Dr. Sturgis specializes in the fields of Science Fiction/Fantasy and Indigenous American Studies and answered a few questions via email for 365 Days of Star Wars Women. I was five-and-a-half years old in the summer of 1977. I had never seen a “grown up” film in the theater, but I was already a great fan of the original Star Trek, which was running in syndication. As the buzz around Star Wars built, I lobbied and campaigned for the chance to see it. Eventually my parents took me – not once but six times! Watching the film marked a turning point for me. 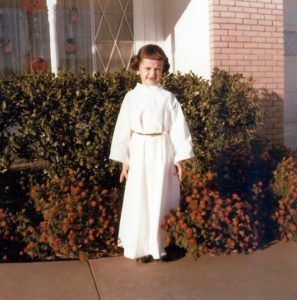 That autumn I went to kindergarten wearing Leia buns and Chewbacca knee socks. My parents were (and are) wonderful about encouraging my enthusiasm: books, action figures, inflatable lightsabers, costumes, you name it. We did (and do) quote the films to each other. Star Wars has informed every stage of my life, and it continues to be a common language that all of the members of my family members speak with tremendous affection. Do you think if you were introduced to Star Wars when you were older would your love for Star Wars be as strong? Honestly, I do. While I certainly feel sentimental about my early Star Wars experience – waiting for my next issue of Bantha Tracks to arrive in the mail, or sitting around the radio with my parents and listening to new (!!!) Star Wars scenes depicted in the radio dramas – I am confident that my deeper appreciation of Star Wars is not dependent on nostalgia. For one thing, Star Wars is closely intertwined with other subjects with which, beginning at different (and often later) points in my life, I have developed lifelong interest and engagement, from the fiction of Frank Herbert and J.R.R. Tolkien to the films of Akira Kurosawa and Jiang Wen, and from classical mythology and Buddhist philosophy to world history and its examples of liberty and oppression. In other words, I would have found Star Wars if Star Wars hadn’t found me first! For another thing, new Star Wars storytelling continues to meet me where I am now in my life. Star Wars is not a static thing trapped in time, but rather a series of timeless, evolving, and remarkably insightful symbols and ideas that relate to the human condition. How could I fail to fall in love? Do you have a favorite and/or least favorite Star Wars film? Different Star Wars films speak to me at different times. I appreciate all three of the trilogies for distinct reasons, and when I return to them I find new things to enjoy. The common factor, it seems, is that Star Wars always manages to surprise; if you had asked me two years ago about my favorite film, I think I would have struggled to choose between A New Hope and The Empire Strikes Back. Today, though, it is undeniably Rogue One. For people unfamiliar with your work can you give us an idea of the kinds of topics you teach and write about and how that relates to Star Wars? I earned my Ph.D. in intellectual history, which is the history of ideas. I’m interested in big questions and big patterns, so to speak. My two areas of concentration are Science Fiction/Fantasy and Indigenous American studies. I write and teach about the history of science fiction and history through science fiction, as well as Native America. There are points where these two subjects converge, too; for instance, I write and teach about Indigenous Futurisms, the genre in which Native authors today use SF to respond to the past and reclaim the future. Star Wars not only changed science fiction, but it also served to distill parts of the history of science fiction up to that point (from the Edisonade to Flash Gordon to Dune). And today, I would argue, Star Wars storytelling is more closely tied to the cutting edge of the genre than ever before. 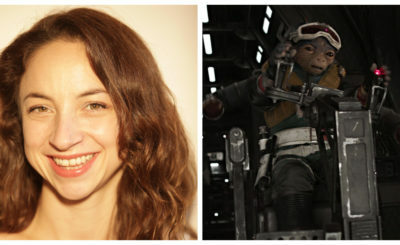 Look who is writing Star Wars novels: Mur Lafferty! Justina Ireland! Ken Liu, who deserves (and has won) all of the awards!!! For that matter, Star Wars from its very inception has been engaged with “big idea” history. When do rebellions succeed? Why do democracies choose tyrants? How do we know we are not the Empire? (Answer: Sometimes we are.) Many of the complicated subjects Star Wars investigates – colonialism, resistance, sovereignty – directly relate to Native America. In short, everywhere I turn, I find Star Wars there, too. 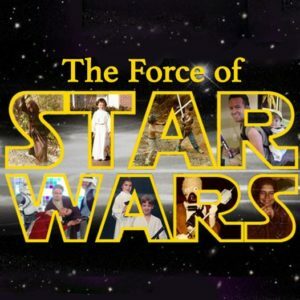 Can you explain what your Star Wars course The Force of Star Wars: Examining the Epic is, why you decided to create it, and what you hope your students will learn from it? In the past, I had taught Star Wars as one text among many in science fiction-related classes. Mounting interest in the new film trilogy, however, convinced me that the time was right to offer a course devoted to Star Wars alone. The course content is divided into several parts. As a class, we explore how George Lucas and his compatriots created Star Wars, how the franchise developed, and where it is now in the Disney era. We spend a lot of time considering what inspired and inspires Star Wars, both the personal stories of the creators and the larger historical and storytelling ingredients that inform the saga. We also watch each of the films and analyze their symbols, messages, and meanings, with a focus on the “big questions” (good/evil, free will/destiny, etc.). We investigate fan responses to Star Wars by reading fan fiction, viewing fan films, etc. Lastly, we look at the critical reactions to Star Wars and consider what Star Wars does (and doesn’t do) best and how this continues to evolve. At the same time, all of the students in the class undertake a solo, semester-long research project related to Star Wars, which they ultimately share with their classmates. I work with the students one-on-one to help them choose a topic that speaks to their majors and/or personal interests and ignites their imaginations, develop a research plan that takes them to the heart of the matter, and formulate a critical argument they can defend with the evidence they have discovered. This is, to be honest, my very favorite part of the class, because every semester students surprise me and teach me something new. I gain great joy watching them fall in love with asking questions and seeking answers. Most of all, I hope students will learn from the course that storytelling – and especially mythic, imaginative, science fictional storytelling – is more than entertainment; it’s how we explore our own histories, how we cultivate morality, and how we ask important questions about who we are and what we should be. I hope they will think more critically about what they watch, read, and hear, and I hope they will seek out stories – in or outside of Star Wars – that encourage and empower them to be their best and most courageous selves. How long have you taught the class? I first offered the class in 2015, and I have taught it ever since. These days I teach it every semester including summers, and sometimes (like this term) I teach more than one section of the course. I regularly offer it as an undergraduate class, but I also have offered it more than once at the graduate level. In addition, I have “guest taught” the course twice at universities other than my home institution. Have you noticed many changes in either the students who choose to take your class, the questions they ask, or the subjects they choose to focus on over the years? There is so much variety from one semester to the next that I haven’t noticed many distinct trends. For that matter, the research projects the students conduct cover such a broad range of disciplines – from physics and biology to history and philosophy to business and art design – that I don’t see a great deal of repetition. The only shift that comes to mind is that some students who previously might have approached Star Wars works through the lens of gender or race or sexual orientation are now just as likely to want to approach today’s Star Wars consumers (and their backlashes and responses to backlashes) from the same perspective. I would lament the phenomenon of “fans behaving badly,” except I don’t think the term “fans” actually applies to much of the different backlash phenomena. Are most of the people who take your class huge lifelong Star Wars fans or do you ever get any newbies or more casual fans? Usually there is a mix, and that makes for terrific discussions. Some students live and breathe Star Wars, and others have been exposed to it casually and are looking for an excuse to dive deeply into the galaxy. It’s quite touching; many of the newbies admit during the first week of class that someone they care about (a family member, romantic partner, or close friend) loves Star Wars, and they want to understand it better in order to share that connection with them. Every semester, it seems, some students new(er) to Star Wars express envy at those who grew up in “Star Wars homes” and desires to establish their own “Star Wars homes” in the future. What would you say the gender split is typically for your class? This varies. In some semesters the split is fairly well balanced. In others, more women register for the course than men. Interestingly enough, I don’t recall any semester in which the men outnumbered women. How can people who are interested in your Star Wars class find out more information or even better, sign up for it? At the moment, this class is only offered to students – including remote, online students – who are registered at Lenoir-Rhyne University, so I would recommend starting with the university. In addition, I am part of the Hugo Award-winning podcast StarShipSofa, an audio science fiction magazine that explores all aspects of the SF universe. I contribute a monthly “Looking Back on Genre History” feature to it. I often share my own work on Star Wars there in the podcast, and in turn I share those episodes with my students in the class. I invite everyone to give the podcast a listen! What articles or books would you recommend to Star Wars fans who are interested in learning more about the cultural importance of Star Wars? This is a tough question, because I have devised something like a starter bibliography for a number of different disciplines to give students a springboard for their research, and there is a lot of excellent work on Star Wars out there! J.W. Rinzler’s books are of course a treasure trove for anyone delving into the making of Star Wars. I recommend starting with “big picture” works that give readers a sense of scope and scale, such as Chris Taylor’s How Star Wars Conquered the Universe and Paul F. McDonald’s Star Wars Heresies. There are also quite a few excellent anthologies of critical essays that show Star Wars being taken seriously by scholars (Star Wars Psychology edited by Travis Langley immediately comes to mind) as well as more focused studies of particular subjects (and Matthew Bortolin’s The Dharma of Star Wars is a personal favorite). What is the most recent book you have written and what inspired you to write it? The most recent book I wrote is a biography of the great pan-tribal leader Tecumseh (imaginatively titled Tecumseh: A Biography). 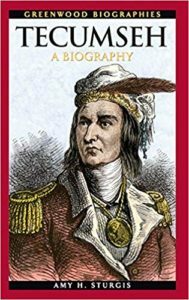 I had just published a history of the Cherokee Nation’s experience with the Trail of Tears, and my editor with that press kindly invited me to write a biography of any Indigenous historical figure I chose. Tecumseh – a visionary and inspiring Shawnee leader, a uniter and defender of Native North America, a man known as much for his ethics and mercy in war as his genius in military strategy – was my very first choice of subjects. Although this book came out a few years ago, it continues to open doors for me. Thanks to that biography, I became a historical consultant and on-screen interviewee for Leonardo DiCaprio’s The Men Who Built America: Frontiersmen documentary, which aired on the History Channel in March 2018. And in June 2018, I was invited to speak about Tecumseh as part of the Absentee Shawnee Tribe’s Strength of Tradition Project, which was both thrilling and humbling. My most recent book-length projects have put me in the role of editor rather than author. I had the privilege of being the guest editor of Apex Magazine’s all-Native American issue, “A Celebration of Indigenous American Fantasists” (August 2017), for which I sought out amazing science fiction, fantasy, horror, and scholarship by Native authors. It was an incredible experience, and I am delighted beyond words that Rebecca Roanhorse’s short story from my issue (“Welcome to Your Authentic Indian Experience™”) went on to win the Hugo and Nebula Awards this year. Rebecca herself also received the John W. Campbell Award, and deservedly so. In 2018, I had the pleasure of editing the graphic novel Elevator for Hocus Pocus Comics. Written by Dwight L. MacPherson, illustrated by Randy Valiente, and lettered by Pietro “Pitt” Rotelli, Elevator is a 21st-century reimagining of Dante’s Inferno, and I am proud to have played a small part in bringing this powerful story to readers. You have given a lot of presentations at conferences over the years. Are you usually asked to talk about a specific topic for these events or do you have the flexibility to talk about a variety of subjects? I love presenting work on the subjects that I care about, and I’m always so happy when I am invited to speak! As for flexibility, it depends on the event. Some organizers have a general subject (science fiction, for instance), and they are happy for me to narrow this down to relate to my current research project(s). Others have read something I’ve published or seen another talk and have a very clear idea of what they would like me to cover. 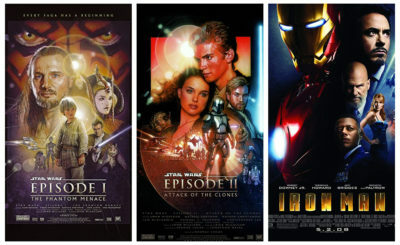 If you could be dropped into any time period of Star Wars (prequels, original trilogy, sequel trilogy) which one would you want to experience and why? Another tough question! I’m a fan of winter, not summer, so I’ll skip the desert and swamp planets, thank you very much. The prequel-era Jedi Archives would be perfect for a historian, so that might be my best bet. Ultimately, I think the when and where would be dependent on the who. Perpetual student that I am, I would like to spend time with someone wise whose brain I could pick. I might follow around Qui-Gon Jinn wherever the Living Force called him, or eavesdrop on the Guardians of the Whills on Jedha, or enjoy a friendly drink or three with Maz Kanata. Are you hoping for any specific character to be the focus of an upcoming stand-alone movie? Thank you for asking! I have the very great honor of being the keynote speaker at an amazing event – last year it drew more than 8,000 attendees! – called the Generic Magic Festival in Roanoke, Virginia on October 6. I will be discussing the future of SF/F fiction. I have also been invited to speak about SF as a guest at Marietta College in Ohio on November 15. As for my latest scholarship, I just completed an essay on Indigenous Futurisms that will appear in a new companion to science fiction anthology due out in 2019 with Peter Lang. Can you share some links to your classes/work that I can pass on to readers? Thank you so much! This has been a delight. My official website is amyhsturgis.com, and I would invite everyone to pay me a visit there. The site includes links to all of my publications and podcasting work as well as my other social media information. In addition, here are my Star Wars works that are available for free “in the wild.” I would love to share these with your readers! • Hear my October 2017 Guest of Honor talk from the A Long-Expected Party 4 con (“The Jedi of Middle-earth? Tolkien’s Influence on Today’s Star Wars”) on the StarShipSofa podcast here. * Read my December 2015 Reason Magazine article “Star Wars, Remixed” here. • Hear my November 2017 interview on the Unmistakably Star Wars podcast about “What Indigenous Peoples in Star Wars Can Tell Us about Our Real World” here. • Hear my April 2017 episode of the My Star Wars Story podcast here.